We told an election-day pollster we were worked up about climate change, even as we voted with the oil companies to do nothing about it. Are we phonies? Or is it something else? Seeing as how they’re still counting the votes in our midterm election, I want to circle back and focus on a couple of striking results that haven’t gotten much attention, probably because all gets swamped by the daily fire hose of news about he-who-shall-not-be-named. The first brought to mind that old joke, about what’s the definition of an environmentalist? It’s somebody who already owns a mountain cabin. Seriously I have never seen a wider disconnect — between people saying they want to do something about an urgent issue, and then resoundingly voting not to — than what happened with the climate-change measure on the ballot here, Initiative 1631. 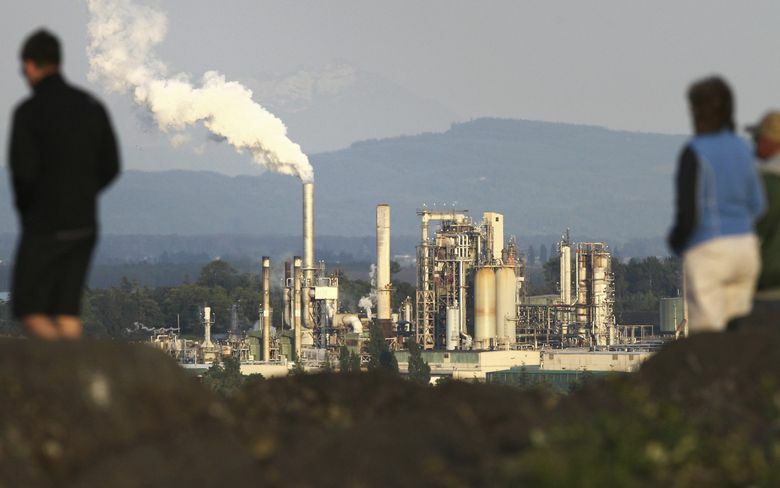 Check this out: By 73 to 27 percent, Washington state voters told an exit poll (actually a phone survey of 4,368 voters here) that they are “very or somewhat concerned” about climate change. So that’s an enormous 46-point advantage for the climate-change team built in among the electorate. Yet this same electorate voted down the climate-change initiative by 13 points, 43 percent to 57 percent (after also voting down a similar carbon-tax measure in 2016). Awkwardly, it means we’re fine telling pollsters we’re green and worked up about the fate of the planet. Even as we’re voting fossil fuel. Are we just hopeless “green hypocrites?” Or are there deeper lessons to be learned from the jarring outcome? Backers of Initiative 1631 blame the loss on the $31.5 million gusher of oil money spent against the measure, a record here. That probably had a lot to do with it, though the carbon tax two years ago only attracted a tiny fraction of that opposition — and it failed, too. A bigger cause, I think, is that Washington is just congenitally tax-averse for such a blue state. In the past 20 years, we have voted for only two statewide tax increases (a cigarette tax in 2001, and a 6.5-cent gas tax in 2005). That’s it, and those are some tiny taxes. Every other statewide taxing effort up for a vote has failed, no matter the purpose of the money. The further problem with the carbon tax or fee is that it’s a sort of sin tax on fossil fuels. Economists say that’s the best way to reduce carbon pollution. But to voters, I sense it feels more like we’re being told to drink a kale-quinoa smoothie. It’s punishment for a good cause. Nothing comes free, and Hawaii’s plan will likely also result in higher power rates. But a rallying cry of “We’re going 100 percent renewable to tackle climate change,” with some incentives, and maybe the desultory politics of climate could be rebranded as a sort of green New Deal. They say hypocrisy is another word for the gap between your aspirations and actions. Whatever you call it, the Evergreen State’s gap is definitely showing. The other election result I noticed involves the minimum wage. Which, speaking of a rebranding, continues to amaze. Two more red states, Missouri and Arkansas, approved huge increases in their base wages — Missouri from $7.85 to $12 an hour, Arkansas from $8.50 to $11. Both won by more than 25 percentage points. This means higher minimum wages now have been voted on in 12 states in the past four years, and won every time. None of the elections were close (Washington state voted in 2016 to raise the wage to $13 over time, and that won by 14 percentage points). These votes don’t lie: After being derided at the start, the higher minimum-wage movement is possibly the only policy idea going right now that is popular absolutely everywhere, in rich states and poor, red states and blue. Democrats, with your newfound majorities, if all you did was push a 100 percent renewable-energy crusade and a higher minimum wage, you would find yourselves sitting pretty when the next election rolls around.